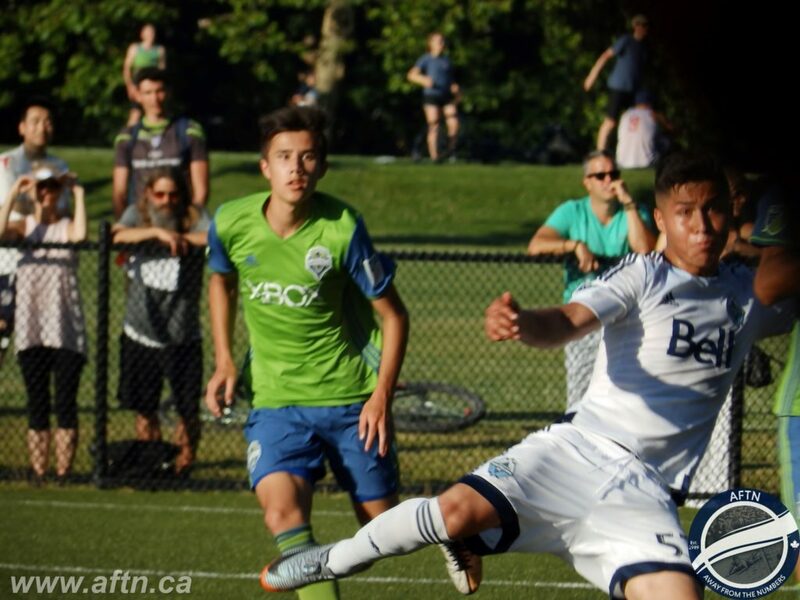 The final scoreline might may not tell the full story of the match, but Vancouver Whitecaps U16s were dominant as they made history on Wednesday night, beating Seattle Sounders U16s 3-0 at UBC to claim their first ever place in the USSDA semi-finals. With so much on the line, it was understandably a cagey first half from both teams, with the visitors having a slew of chances, hitting the bar and coming close on a couple of occasions. The first goal was always going to be crucial in a game between two sides that know each other so well. Whitecaps captain Alessandro Hojabrpour got it in the 26th minute, and when Jose Hernandez and Jefferson Alade struck another two in a blistering five minute spell to start the second half, it sucked any remaining spirit out of the Sounders and the ‘Caps advanced. “We looked a bit tense in the first half,” ‘Caps U16 coach Carl Valentine told AFTN after the match. “It’s a big game, we’re at home, we’re playing Seattle, coaches are out and watching. You could see that they were a little bit tentative. I thought we still controlled the game for the most part and they were dangerous on the set plays. “We were just a little tentative in the way we played, the way we pressed. Not playing lines. We were kind of playing not to lose the game. It’s tough sometimes. You’d like them to be playing in more games like this where they feel that kind of pressure. 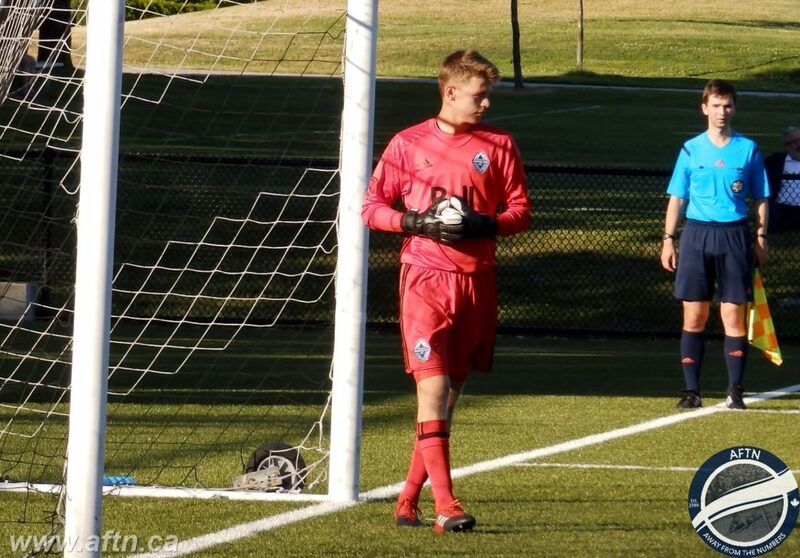 With U16 head coach Adam Day away on a coaching course, assistant coach Valentine took charge of the team for their historic victory, and the Whitecaps legend used all his experience to help see the guys over the line and calm them down, in what was one of the biggest games of their fledgling footballing careers. “I’ve been where the kids have been,” Valentine told us. “I’ve had the dreams that these kids have had, so if I can use my experience for them to know what the little things they need to do to get to that level. Today was a great experience. Valentine’s half time team talk clearly worked and the ‘Caps came out all guns blazing to start the second half, demolishing the Sounders’ hopes in an impressive five minute spell. Leading scorer Jose Hernandez (pictured above) doubled the ‘Caps lead just three minutes in, burying a low Gurman Sangha cross to the back post. That was Hernandez’s fifth goal in the ‘Caps four playoff matches so far, taking his tally for the season to 23. Valentine views the striker as a “big talent” and one “we’ve got high hopes for” in the future and he’s had an exceptional postseason, with the promise of a lot more to come. The same is also true of Jefferson “goal-a-game” Alade, who made it four goals in four playoff games when he pounced on a rebound to fire home Vancouver’s third. Valentine feels Alade is “coming into his own in the playoffs”, showing the promise that brought the forward west from Edmonton, before an injury derailed the early part of his season. Seattle pushed to try and get something back, but when ‘Caps keeper Evan Ince (pictured below) pulled off a fantastic penalty save with 14 minutes remaining, along with a number of other impressive saves, the Sounders knew it wasn’t going to be their day. The ‘Caps were through to the semis. “We had one bit of quality in that first half and we scored the goal,” Valentine told us. “That’s what we told them at half time. Just have a little bit more belief in the game. I felt Seattle played as well as they could and we were kind of not in second gear. Then they came out the second half. They upped the tempo a little bit and got the two quick goals. After narrow quarter-final defeats for the U16s in 2014 against Chicago Magic PSG and Georgia United in 2015, the young ‘Caps now head to LA next Friday for the USSDA semi-finals for the first time, with a chance to make some more history. The ‘Caps U16s will now look to emulate the U18s achievements in 2012 and 2016 and reach the Championship game. The 18s lost two late ones to Dallas on both of those occasions, and the ‘Caps will be hoping it won’t be third time unlucky against their Texas foes. 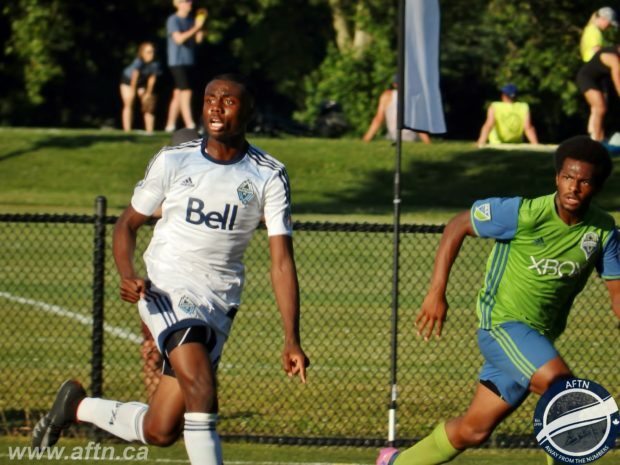 The draw for the semi-finals hasn’t been confirmed yet, but standing in the Whitecaps way of a first national title are three other MLS academies – FC Dallas, Atlanta United, and Real Salt Lake AZ. Heading in to the playoffs, Dallas were the number one seeds, with Atlanta third, Vancouver eighth, and RSL ninth. That will see the ‘Caps facing Atlanta United for a place in the Championship game, and possibly another date with destiny with Dallas. The ‘Caps have a tough battle ahead, but it’s one they will feel they have every chance of winning.